Are you a fan of book adaptations? These sound really good, can’t wait to see them on the big screen. You can read the novels first before you see the film release . Markus Zusak, Mark Helprin and Joyce Maynard are the authors who have all been given the big screen treatment. A New York Winter’s Tale – released 21st February. A Winter’s Tale was written by Mark Helprin and originally published in 1983. Set in a mythic New York City, the story spans more than a century, ‘A New York Winter’s Tale’ is a story of miracles, crossed destinies, and the age-old battle between good and evil. It topped the New York Times List when it was released, and is set to be one of the most charming movies of the year. Akiva Goldsman makes his feature film directorial debut and the cast includes Colin Farrell, Jessica Brown Findlay, Russell Crowe, Jennifer Connelly, Matt Bomer and Will Smith are all on board. The Book Thief – released 26th February There will be a film of Markus Zusak’s novel which tells the story of Liesel, an extraordinary and courageous young girl sent to live with a foster family in World War II Germany.She learns to read with encouragement from her new family and Max, a Jewish refugee who they are hiding under the stairs. For Liesel and Max, the power of words and imagination become the only escape from the tumultuous events happening around them. The book is narrated by death, and it will be interesting to see how this is interpreted on the big screen. The movie stars Geoffrey Rush and Emily Watson and will introduce us to the talents of Sophie Nelisse and is directed by Brian Percival. Labor Day – released 28th March Kate Winslet is set to return to the big screen this spring with ‘Labor Day’ the film adaptation of the novel by Joyce Maynard. Labor Day follows Adele and her thirteen-year-old son who help a stranger – a man who turns out to be an escaped convict. The events of this long Labor Day weekend will shape them for the rest of their lives.Kate Winslet will play Adele and it will feature Josh Brolin, Tobey Maguire and Clark Gregg. Jason Reitman will direct and has also written the screenplay. The Fault In Our Stars – released 20th June The number-one bestselling novel is written by John Greene (5 stars from 22 readers) and explores the themes of illness and fear as well as love and relationships.Shailene Woodley and Ansel Elgort star and Josh Boone is in the director’s chair. 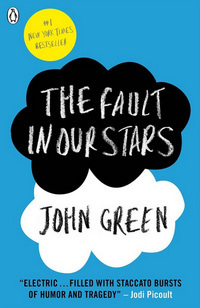 It tells the story of Hazel and Gus, two extraordinary teenagers who share an acerbic wit, a disdain for the conventional, and a love that sweeps them on an unforgettable journey. Their relationship is all the more miraculous, given that they met and fell in love at a cancer support group. Willem Dafoe and Laura Dern are also in it. The Maze Runner – released 24th October The Maze Runner was published in 2009 and is the first in a trilogy of novels by James Dashner. Set in a post-apocalyptic world. Thomas is deposited in a community of boys after his memory is erased, soon learning they’re all trapped in a maze that will require him to join forces with fellow “runners” for a shot at escape. Wes Ball make his directorial debut. This entry was posted in Book Reviews, Books, Film Tie In and tagged Book Reviews, Film. Bookmark the permalink.